There is never a year that passes without me finding my new “indie” heartfelt comedy to champion. Win Win is a comedy much in the vein of films like Away We Go and Little Miss Sunshine in which the laughs keep coming, but they aren’t afraid to touch on serious issues. Mike Flattery is like many Americans, he has a mortgage, a family, and a job that all of the sudden doesn’t pay the bills. His law practice is floundering, everything keeps breaking, and he can’t even catch a break as the local high school wrestling coach. Desperate times call for desperate measures, and when an elderly client needs new guardianship he jumps at the chance to collect the paycheck every month. Rather than take the time to watch over the elderly Leo (Burt Young), Mike instead puts him in a retirement home to collect the paycheck. When Leo’s grandson comes knocking though Mike realizes he has bit off more than he can chew. Leo’s grandson, Kyle (Alex Schaffer), is a troubled youth with a good heart, and top notch wrestling skills. Despite his monotone voice and calm demeanor Kyle is boiling with problems due to an estranged mom, and problems in his original home. Kyle and Mike form a new bond that is explored throughout the film. It isn’t easy to balance comedy and drama. If you get too heavy handed with either the result can be disastrous. Luckily, much of the comedy comes in the form of the supporting cast, including the brilliant Bobby Cannavale , who plays Mike’s best friend, Terry. Cannavale elicited the most guffaws from the crowd, and really spotlighted himself as a fantastic supporting actor. Giamatti is rock solid as always as the stressed, but kind hearted Mike. Despite knowing the choices he makes early in the film are at the very best disappointing, and the very worst reprehensible, you still can’t help but sympathize with his plight. Everyone has been in a situation where they have made a less than stellar choice, and upon review realized their mistake. Giamatti sells the mistake, and the consequences so well. He also works well with co-star Amy Ryan who plays the strong spouse in the relationship. Schaffer does well in his first role, but isn’t given as heavy of a load as some of the other cast. He mostly has to look apathetic and bored much of the film. Although, when emotion his shown the result is palpable. I’m not sure Schaffer will be able to translate his performance into juicy roles in the future, but he fits solidly in this film. Director Thomas McCarthy continues to hit it out of the park, his previous films The Visitor and The Station Agent were both solidly directed films, and nothing changes this outing. If anything McCarthy seems to be getting more confident behind the camera. His script work and directing make for a fantastic film to watch. 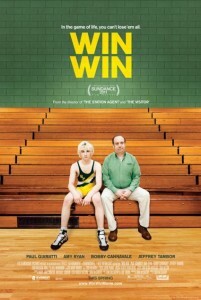 If you aren’t in the mood for a gross out comedy, but want something with a lot of heart, and a fair amount of laughs Win Win is a perfect film to see. This is the type of film you’ll see mentioned from time to time during next year’s awards season.